Gold side production is an India based leading manufacturer and exporter of jewellery making machinery & equipments since 1992. The brand name of the company is “LION GOLD SMITH”. The founder Mr. Dineshbhai Rabadiya has continuously strived to achieve excellence in qualitative production. Gold Side is in to manufacturing of Special purpose rolling mill, Tube forming machine, Jewellery polishing machine, faceting machine, Design rolls etc. 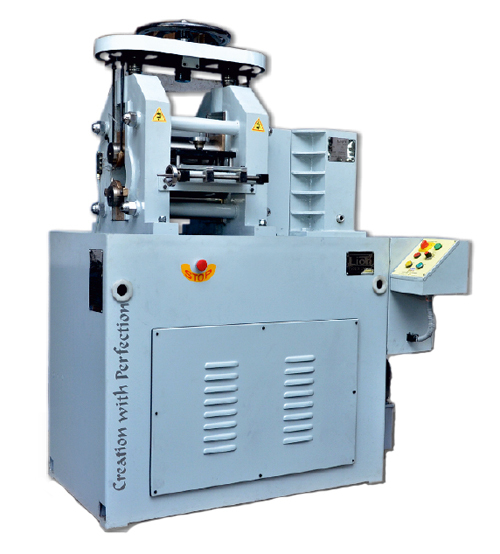 The company’s range of products includes small, medium & special purpose rolling mills, Bangle sizing, Ring sizing machines, S.S.Media for polishing machine. The Company adheres to kaizen quality control system measure at each production process that makes our final product in Gold smith tools and Machinery most durable and builds customer satisfaction. ‘Our customers are our backbone and we are always taking prompt action in executing their requirements of jewelry making machinery and equipments’ says Rabadiya and adds, our corporate philosophy includes “Our utmost mission is to provide wide range of Gold smith tools, Jewellery making machine & Equipments in excellent quality of product & service.” Gold Side Production generates new ways that will always lead the jewellery making industry. We would like to pursue and explore the ocean of infinite possibility with our customer. We will provide our customer’s with unique product and information that will be of great help in making jewellery, products of precious metal and their related products.